Plywood framing pieces for one of the front modules are shown fully prepared and laid out ready for construction. Research for our new layout began in 2012. We obtained plans from the NSW Railways, along with photographs, plans and other data from searches on the Internet and through various reference books and magazines. A visit to the location in November of that year was also undertaken, with many images captured. Track plans were drawn up, modified, and re-drawn until we were all happy with the proposed track layout. The metaphorical "turning of the first sod" for our new layout took place in October 2013. After exhibiting Wallerawang at the 2013 Liverpool exhibition over the long weekend, and picking up awards for 'Best Model Railway Layout' and 'Best Australian Prototype Layout - Club', our group took a few weeks off for a well-earned break. In late October we began proper construction of the new layout. 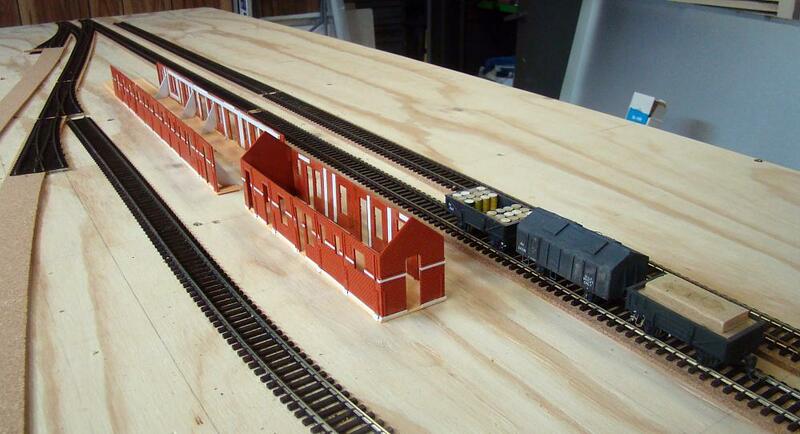 Enough plywood sheets were purchased to construct two front and two back modules for the new layout. We set up the saw bench and began cutting up the 12mm thick ply sheets into 100mm wide strips to be used as the main framing members. A series of 50mm diameter holes were cut in the 12mm thick framing pieces to help reduce the overall weight of each module. The 9mm thick ply sheets we cut into 50mm wide strips to be used as strengtheners and runners underneath each module. The 9mm thick ply is also used to cover the top of each module as the main baseboard. 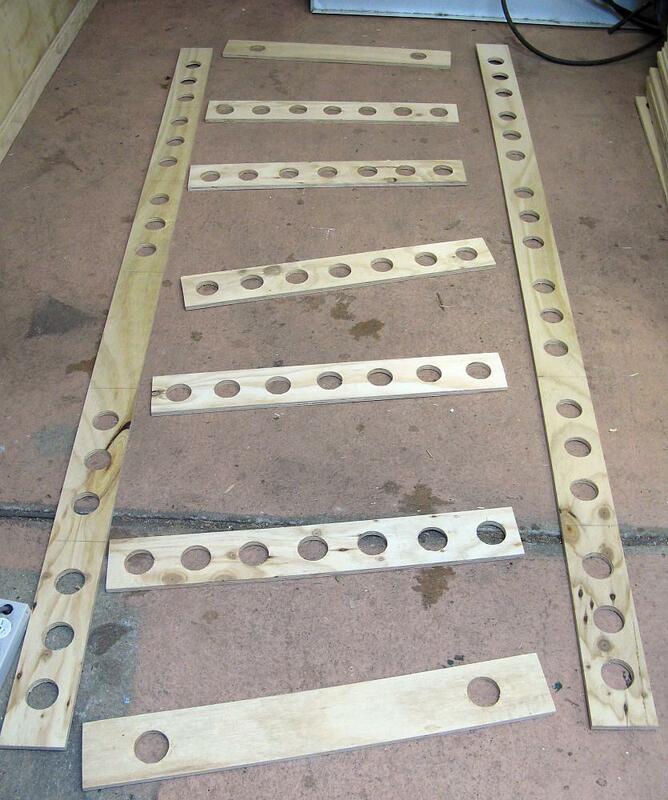 The 12mm thick ply framing members were glued and screwed together to form the basic framework 'ladder'. A sheet of 9mm ply was then glued and screwed on top, with the framing squared up as we worked. A 50mm wide runner was glued and screwed to the underside long edge of each module. After finishing the construction of four modules, the two modules to be used at the rear of the layout were stored away. 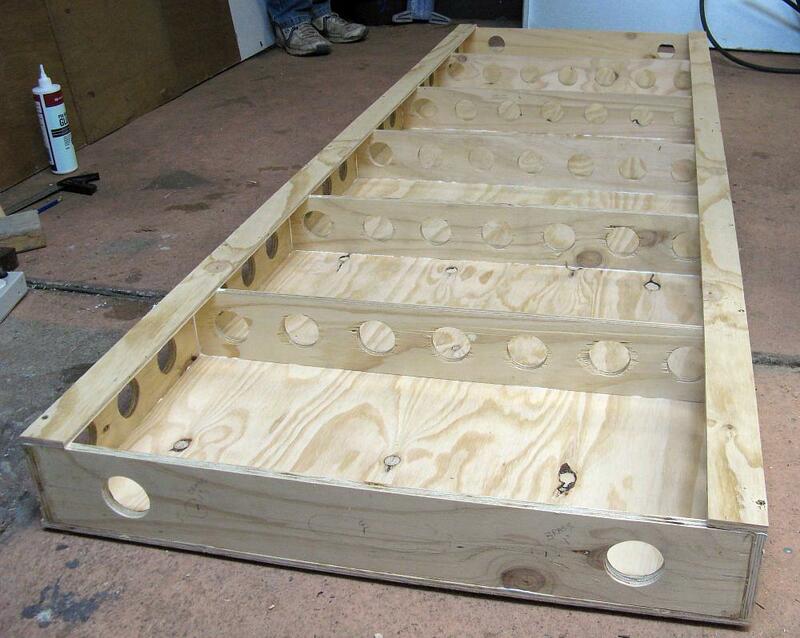 All plywood framing is completed for one of the front modules, which is shown here upside down. Once the white glue has dried, 100mm lengths of 50x50mm pine will added to each corner for additional bracing. The remaining two modules were placed end-to-end on their legs ready for joining. Where the modules join each other, pattern maker's dowels (used for exact alignment of the modules) were inserted in each end framing piece, before loose-pin hinges (used for holding the modules together) were screwed onto the sides. Once the alignment and fixtures were completed, work started on setting out the trackwork. The main lines and the sets of points on the module that will house the station were used as the starting place. Set out of trackwork has begun on the front module which will contain the main station. 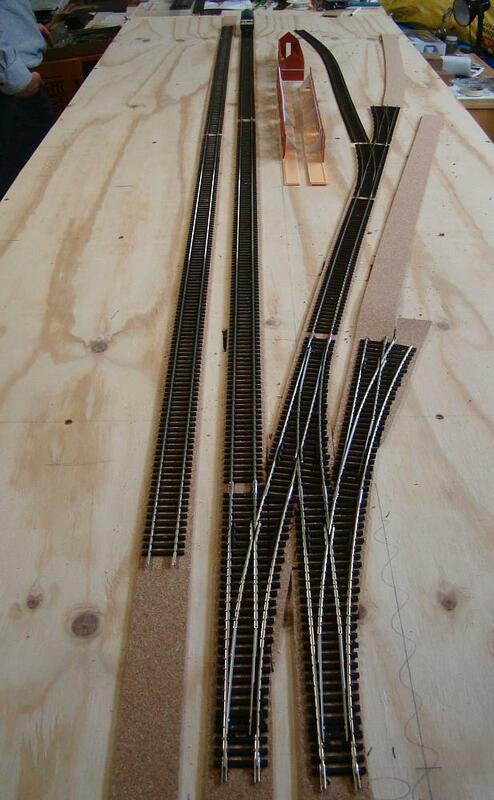 The 2 straight tracks are the Up and Down main lines and the points are the start of the set-out for the yard tracks. Under the Down main line roughly in the centre of the picture can be seen the edge of the cutout in the ply for a future undertrack uncoupling magnet. Provision for wiring and operations were taken into account well before the first length of cork sub-roadbed was laid. We are using Peco flex track and electrofrog points, which are all slightly modified by electrically insulating the frog, soldering wire feeds between each stock rail and its adjacent point blade, and removing the over-centering spring. The throwbar and the sleepers around it are also trimmed to help make the points look more realistic. As all turnouts will be fitted with Tortoise slow motion point motors in the future, a hole was drilled beneath the centre of the throwbar of each point in readiness for the installation of the control wire. All track is laid on cork strips and all track joins are soldered together. Wire droppers for track power were soldered to the underneath of the rail or on a rail joiner, and dropped through holes pre-drilled in the ply baseboard, before the track was nailed into place. Cut-outs in the ply baseboard were made for the future installation of uncoupling magnets - more on these in a future update. Some very early construction has begun on the island station buildings and they can be seen being used to check clearances for the island platform while doing the track set out. As can be seen in some of the pictures, we have also started work on constructing some of the buildings for the island platform station buildings. More detail will be provided on this in our next update. For those readers who do not already know, by now I am sure you are wondering just what location we are modelling. The bad news is that we are going to keep you guessing until the next update. The Back Platform Road can be seen in the foreground with a few wagons sitting on the Down main.